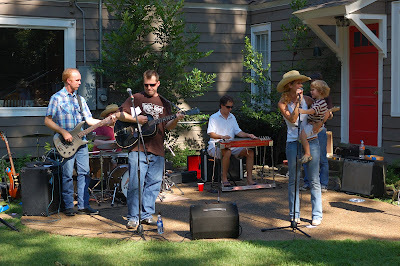 The second season of Memphis Rock-n-Romp got off to a great start thanks to Vending Machine. 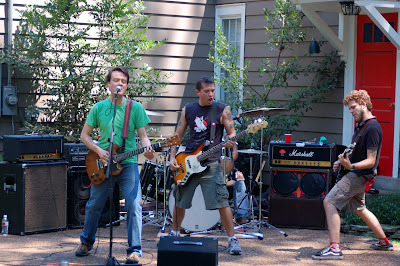 (Fronted by Rock-n-Romp co-founder, Robby Grant). Kelly Anderson, who is bringing the Southern Girls Rock-n-Roll Camp to Memphis this Summer, was on hand to sign up girls ages 10-18. 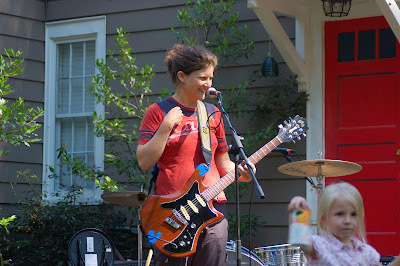 Kate Crowder, our April Rock-n-Romp host, is not only the lead singer of Two Way Radio, but a teacher and kid craft genius. She set up a station for all the rompers to make safari shakers to play along with the bands. As always the banging wall was set up for rompers to bang at will. Plenty of tattoos were also available to keep the kids happy. There were lots of new faces. DJ Colin Butler rocked the yard for awhile with his eclectic mix of music and then the River City Tanlines took the stage. Having never had the chance to see them live, I was thrilled. I was happy to see that some people took our "bring earplugs" advice seriously. However, some people found the hard rock to be quite soothing. 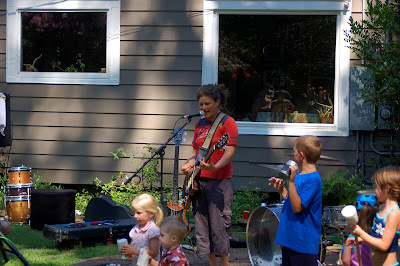 When the music was over, there was plenty of time for the kids to play rock star while the parents chatted and finished off the keg of Abita. 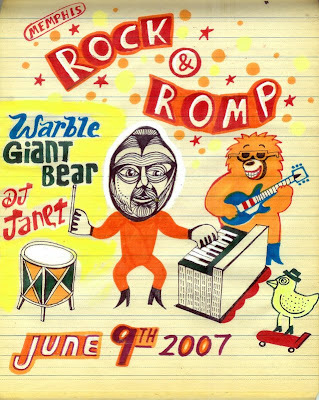 Hope to see you at our next show June 9th featuring The Warble and Giant Bear! 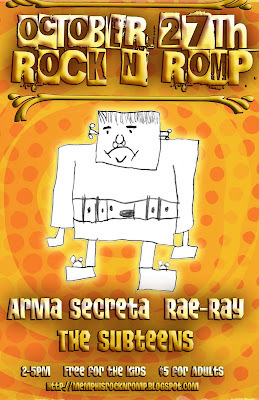 To get on the guest list, email memhisrocknromp@gmail.com. You will be sent an evite with the address for the show. 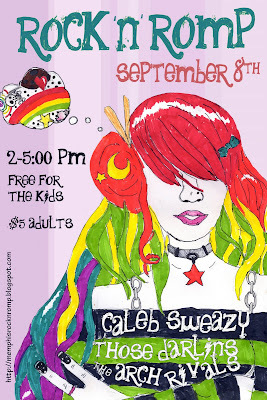 Southern Girls Rock-n-Roll Camp coming to Memphis! To give you a quick overview: SGRRC offers girls age 10-17 instruction in guitar, drums, bass, keys, vocals, and electronic music as well as workshops in DIY arts & crafts, zine making, photography and songwriting. The camp is being held at the Gibson Guitar Factory in downtown Memphis and the dates are June 18 - 23. The coolest part about camp is that the girls get to form a band, rehearse each day with a volunteer band "manager" and then at the end of the week perform a song. The final showcase is going to be on the roof of the Gibson Guitar Factory in true Beatles fashion. More info on the camp is available at www.sgrrc.org. 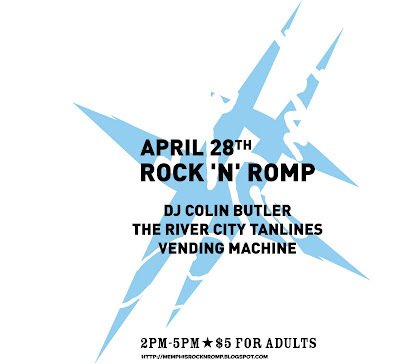 This just in...the line up for the first Rock-n-Romp show on April 28th! 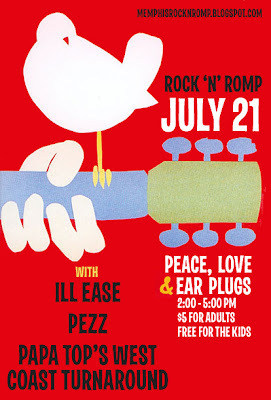 To get on the guestlist, please send an email to memphisrocknromp@gmail.com. Evites with the location will be going out the first week of April.